Join us this Friday January 20 at the (en)Gendered Undergraduate Art exhibit opening and reception. 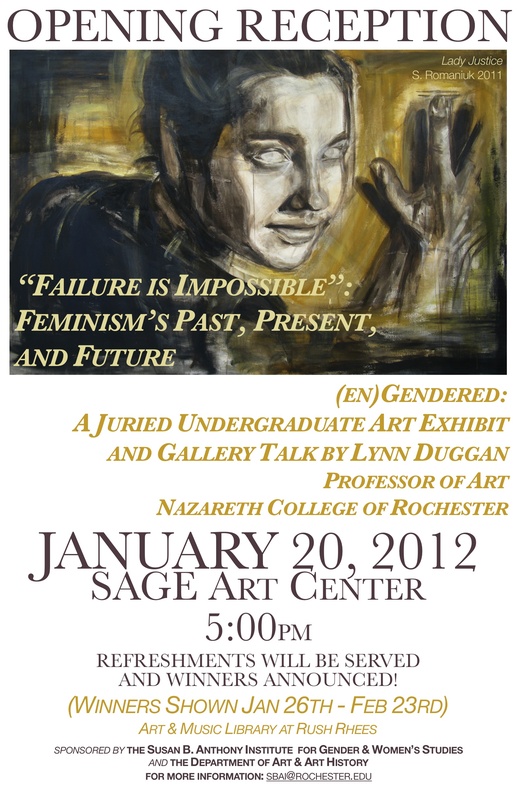 We have much to look forward to for the evening: a gallery talk by guest juror Lynn Duggan, Professor of Art at Nazareth College; the announcement of this year’s three juror’s choice prize winners and eight honorable mentions; and your only chance to see ALL of this years entries! Join us for a wonderful evening of food, art, and mingling. (en)Gendered: SBAI’s annual juried art competition and exhibition asks undergraduate students to submit their work that explores gender or sexuality as those topics intersect with other parts of life. Winners and honorable mentions will be exhibited from January 26 – February 23 in the Art and Music Library. Any questions, please email sbai@rochester.edu. This entry was posted in SBAI Events and tagged #(en)gendered, #art, undergraduates. Bookmark the permalink.